Lawyer Loves Lunch: It's Jam'mer Time! I am going to do you a huge favor. Not a "Let me do your laundry" kind of favor, or even an "I'm running to the store. Do you need anything?" sort of favor. In fact, this is a favor truly deserving of my cheesy (and awesome!) reference to MC Hammer's "It's Hammer Time." I am going to introduce you to the Dessert Toast. Say what?! Dessert Toast. One part breakfast, one part dessert, all parts delicious. See, a few years ago, we were having breakfast with our cousin, Adnan Bhai. * Eggs, toast, potatoes. Delicious but ordinary. At the end of breakfast, Adnan Bhai proudly announced that it was time for Dessert Toast. The hubster and I looked at him confusedly. So Adnan Bhai explained that Dessert Toast was to breakfast what dessert was to, well everything else. In short, a perfect, sweet treat to end the meal. It was sheer genius. Needless to say, the Dessert Toast has earned itself a regular spot in our breakfast rotation. And in case you have any shred of doubt, I demand you toast a piece of bread (preferably sourdough or something with some bite), slather on some salted butter (quickly, while the bread is still hot), smear on a thick layer of jam (and by thick, I mean thick. This ain't no diet food), and devour immediately. And there you have it. Dessert Toast. Sounds pretty much perfect already right. Except well, there's Dessert Toast of the Smucker's variety. I like to call that weekday Dessert Toast. And then there's Dessert toast of the homemade jam, spoon-jam-shamelessly-into-your-mouth-while-your-bread-is-toasting variety. I like to call that weekend Dessert Toast. See, I lucked into one such bottle of homemade Strawberry Lemon Jam courtesy of the fantastic Lisa of Authentic Suburban Gourmet. Needless to say, the jar didn't last long. Like any addict, I consoled myself with Smucker's until one fine day, Lisa and the amazing Gina of SP Cookie Queen offered to teach a few friends how to make jam. Make jam? As in, lower fruit-filled glass jars into boiling hot water? Count me in! And so, a few fabulous friends gathered one fine Saturday to cut, boil, and preserve pounds of fantastic summer fruit. We snacked, laughed, and most importantly, jammed. By the end of the afternoon, we were proudly staring at dozens of jars of homemade Fig Balsamic Jam, Vanilla Santa Rosa Plum Jam, Nectarine Blueberry Jam, and my personal kryptonite, Strawberry Lemon Jam. So for the next little while, I'm stocked up for some fantastic weekend Dessert Toast. Until the jam disappears, of course. Much like poor MC Hammer's Hammer Pants. *Note names have been changed to maintain confidentiality. Although really, if I came up with the concept of Dessert Toast, I would demand credit be given where it was due. Heck, I'd patent it. Wait, can I still patent it?! Hull and roughly chop strawberries. Add to saucepan with sugar, lemon juice, and lemon zest. 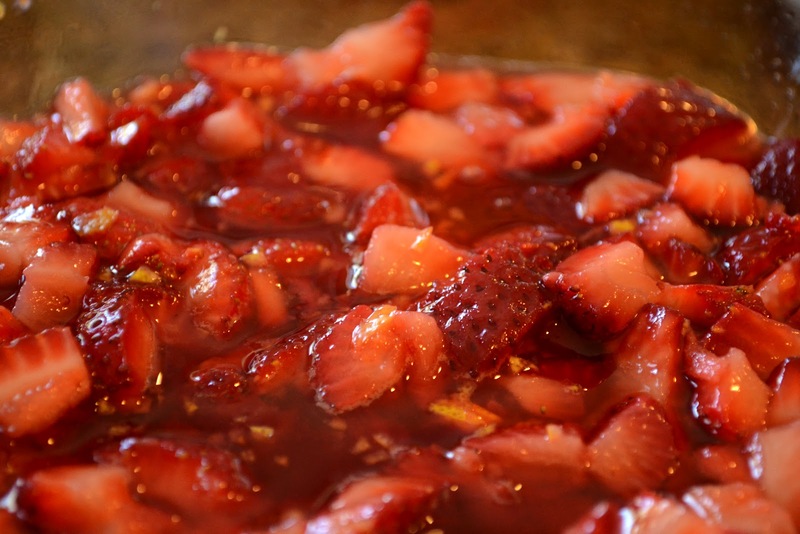 Cook until strawberries break down. 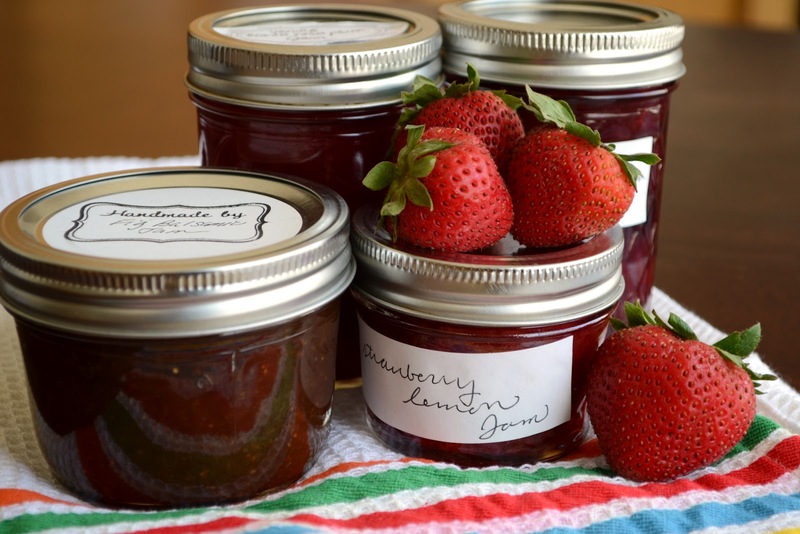 Continue cooking if you like your jam to be smoother. I prefer my jam to be slightly chunky. Especially because I sometimes use the jam as an ice cream topping. But that is another genius post altogether. Prep jam jars ahead of time. Once the jam puree is ready, fill jars, leaving approximately 1 to 1 1/2 inches of room at the top. Seal by dunking into boiling water. Note that the process of jamming is a bit more complicated than "seal by dunking into boiling water" and I really recommend you read one of the jamming posts I've listed above before embarking on your jamming adventure. Ensure jars are sealed properly. Decorate with pretty labels and ribbons. Give out as gifts. Or hoard for yourself. Your call. Oh, lucky you! I was blessed to receive a few jars of Gina's amazing jam and sigh at the memory of all three, because that's all they are now. The Strawberry Cardamom was my most favorite. She is not just the Cookie Queen, she is the Jam Queen; and that's Mom Chef proclaimed, doggonit! I've never called it that (yes, you should patent it), but I love dessert toast. Bring it on! Jam on it! Dessert toast, he he. Christiane is too sweet. Just like yourself, I had such a great time with all of you. Thank you again for opening your house to us. Mini-me is adorable, you have a beautiful family and I hope you are enjoying every minute of it. I'm still craving those cookies you made and I'm waiting patiently for the recipe. Hope you are doing great. Adnan Bhai is one smart cookie and I am totally with him. Sometimes, after breakfast, I eat a spoon of jam straight up. It hits the spot! I'm so glad you wrote this up! I'm absolutely afraid of canning but this jam does look lovely...Are you going to Foodbuzz this year? Azmina - Thank you again for being such a lovely hostess and opening up your home for a fun day of Jamming! 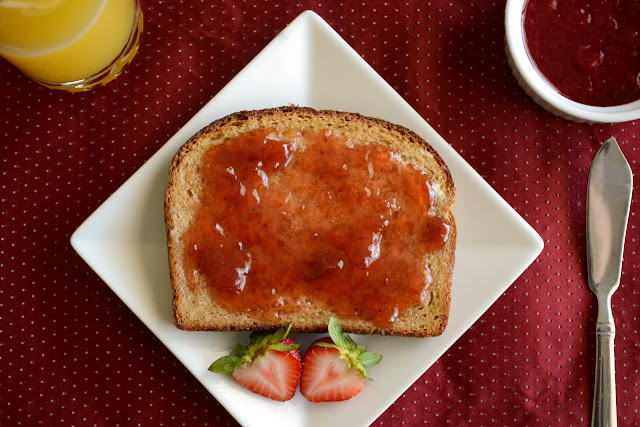 Loving this dessert toast and so happy that you enjoyed the strawberry lemon jam so much. I agree with Gina on those cookies you made - will be making them once you have a post up - those you could certainly sell! Happy Saturday!!! Coincidentally, even I made jam today! Wow, your jam looks so perfect...loved the rich colour! Can I have some on my toast please? Indeed, now that it's summer, I've been up to lots of pickling and jam-making, recently ketchup making! (: I don't bother much with pretty labels because I hoard them for myself. Hur. sounds like a wonderful "invention": the dessert toast! it is absolutely my favorite breakfast, especially the week-end variation on theme. Best bread, best butter, home-made jam. Oh yes!!! Love this post! For me the weekday toast was the toast that I basically had whenever I had toast as a kid. The weekend toast is what I can appreciate now as an adult. Works either way! Love all these jams...I seem to make more every year, but they are so good it can't be helped. New visitor to your blog--I'm a lawyer too! I wish we lived next door. I would totally trade some biscuits/bread for a jar of this jam.